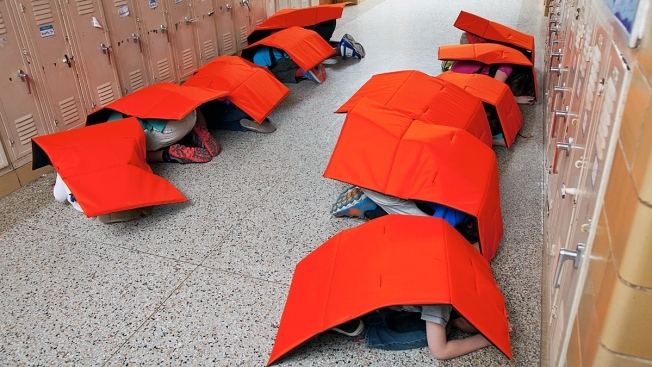 Bodyguard Blankets, made of ballistic fabric and tested with the same armor testing as police bulletproof vests, are designed to protect children during possible shootings and tornadoes. An Oklahoma inventor's podiatrist appointment sparked an idea and yielded an unexpected result: a bulletproof pad, released this month, to protect school children from shootings and tornadoes. The Bodyguard Blanket is a bullet- and tornado-resistant blanket made of 5/16-inch thick ballistic fabric, with backpack-like straps that students and teachers can put on during a disaster. "To say demand has been overwhelming would be the grossest understatement of my life," says Stan Schone, one of the blanket's inventors. His company took 1,000 orders the first day it offered them for sale, and they have sold briskly since, he says. His podiatrist Steve Walker had first been inspired to create a protective blanket for children last year, shaken by the deadly Moore tornadoes and the Sandy Hook Elementary school shooting. Walker shared his prototype with Schone, who then teamed with Oklahoma State University professor Jay Hanan to develop the Bodyguard Blanket. The Bodyguard Blanket has passed 3A armor testing, the same testing used for police officers' bulletproof vests. According to its maker, it can resist bullets of 90 percent of the types of guns used in past school shootings, like 9mm pistols, .357 magnums, 12-gauge shotguns and 22mm pistols. The blankets are pricy — just under $1,000 each — but Schone says his aim is to partner with local companies, donors and other investors to provide the blankets for school districts, so schools themselves wouldn't have to pay for the protection. He also points out that the dyneema blankets are much less costly than comparable bulletproof vests, which he says can cost more than $3,500. ProTecht is not the only armor manufacturer to shift its focus to civilian needs, and its bulletproof blankets are just the latest in a growing range of protective school equipment, following a tragic spate of school shootings — from Newtown, Connecticut, to the shooting sprees at Seattle Pacific University and near the University of California, Santa Barbara. Maryland's Hardwire makes bullet-resistant whiteboards and door protectors and has sold a local county dozens of bulletproof clipboards and shields to provide security for officials and government workers. Other companies, like Bullet Blocker, manufacture a range of bulletproof book bags, backpack inserts and briefcases. But some security experts have cautioned that such safety supplies may be distracting from the need for schools to implement stronger safety procedures and may not be practical. "There's feeling safer, and then there's actually being safer," school safety consultant Ken Trump told NBC last year. "Schools have limited resources, and they ought to use that money very wisely, put it into an additional school psychologist or a school police officer, train your staff and work with first responders. The most valuable school security tools are invisible." Still, Schone feels his company's blankets, which cover the body almost completely, could help students stay safe. He says his company keeps prices close to cost and wants to work with non-profits to make Bodyguard Blankets part of their lockdown protocol. "We didn't do this for the money. Making money was secondary. Protecting the kids was primary," he says.